I am not sure what settings and mode you are using, but with default car settings and fastest, route to Sczczecin continues west on A4 and not north on A8, or through Wroclaw. If I add Zielona Góra as waypoint then both routes goes the same way around Wroclaw (as per last screenshot). Or you could try with randomly selected any place on the route between Wrocław and Zielona Góra. I hope you'd be able to reproduce that, if no I have no idea. I've performed completely clean installation to exclude any configuration issues. 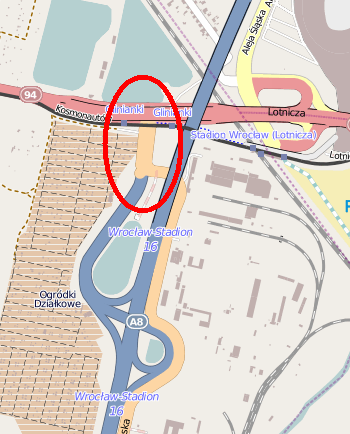 Regarding Katowice->Szczecin route, maybe you have maps of Germany installed? Then you'd have to disable them, because German autobahns are preffered. Sorry that I forgot to mention that. MIne, too. I've ticked on "Faster Route" but disabled "Charge Road" and "Toll Roads" and it still directed me to a toll road while I was very sure that there exists a route that bypasses the express (toll) road. (Ive done it with my Nokia Drive). I guess this feature should better be looked into. There is a "transit network" used for longer routes. That's one reason why shorter and longer routes even for the same area may route differently. Also the transit network has "coarse" resolution and detailed road type preferences may fail (?). On the other hand "Charge Road" and "Toll Roads" is merged bit attribute which should be preserved also in transit network. Can you give me example (way ID or coordinate where toll/charge is set in OSM maps, but used anyway)? Okay, I've figured out what possibly the problem is. There were some "highway=secondary" links on the A8/94 interchange (link) and Navigator has to prefer route through city on the "transit network" which is "highway=primary" all way. However, that's not very good, because route with very short secondary section is much better. I guess that "transit network" consists only of primary and better highways. I'll check on the next update if problem is solved after correcting this. My another observation is that it depends on the running device when Navigator starts to use a "transit network". On my low-memory portable device above curiosities start to occur on much shorter routes. Yes, there are several parameters when routing should switch to transit network. The biggest influence is number of expanded links which is set for old PNDs to 10000, on Android is default 50000 and on PC 100000 ... I would have to double check it. Regarding transit network - it should be much sparse than "basic network" to handle cross-Europe routes. If there are some recommendation for OSM data, please let me know. In TomTom/TeleAtlas data there is extra attribute, and it could be set even on very small roads like entry to ferry.